Stationmaster Tama at her post in 2008. Tama, who had turned 16 in April, died of a heart failure on June 22. During Sunday’s Shinto-style funeral at the station where she served, Tama became a goddess. The Shinto religion, indigenous to Japan and practiced by many Japanese, has a variety of gods including animals. In one of several portraits decorating the altar, Tama posed in a stationmaster’s hat and a dark blue cape. Sake, as well as watermelon, apples, cabbage and other fruits and vegetables were presented to the cat. A stand outside the station was heaped with bouquets, canned tuna and other gifts left by thousands of Tama fans who came to pray from around the country. 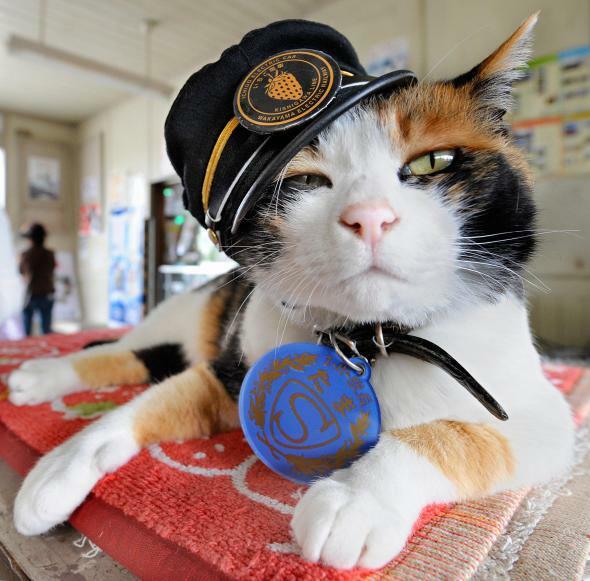 Tama will be succeeded by apprentice stationmaster Nitama, also a calico.